Amazon shareholders are tired of losing money. Amazon CEO Jeff Bezos demonstrates the company’s first smartphone, the Fire Phone, on June 18, 2014, in Seattle. This piece originally appeared on Zócalo Public Square. 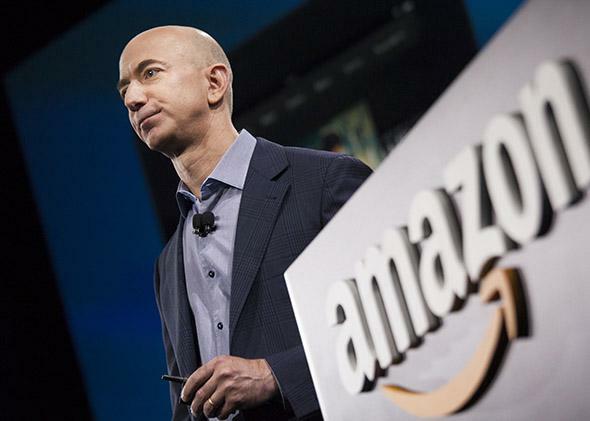 Amazon recently announced a staggering $437 million loss over the third quarter. This three-month period included the disastrous introduction of its new smartphone, a misstep for which the company has already had to incur a $170 million write-off. But the bulk of the quarter’s loss amounted to business as usual: Amazon overspending and discounting to make customers happy (and more numerous). The traditional call public companies hold to discuss their results with outside observers and shareholders was a somber affair, with Amazon CFO Thomas Szkutak doing his best to express contrition, mimicking a mischievous middle-schooler called into the principal’s office to promise he’ll never do it again. His contrition involved repeating adjectives like “selective” and “judicious” any time the subject of future corporate spending and investments in new businesses came up. Investors didn’t buy it. Amazon’s stock tanked more than 10 percent the next day, and is down by almost 20 percent over the past year, a period that has treated most other Internet stocks generously. Apple’s shares, for instance, rose 45 percent in the past year; Facebook’s rose 54 percent. Jeff Bezos, the irrepressible founder, CEO, and top shareholder of Amazon, couldn’t help himself and undercut his own CFO’s regretful tone. In the press release accompanying the quarterly results, Bezos enthused that in the upcoming holiday season, customers will benefit from thousands of “lightning deals” and a program to donate a percentage of their purchase price to charity. To many Amazon shareholders, that may seem a redundant gimmick. As Matt Yglesias has written, Amazon operates like a “charitable organization being run by elements of the investment community for the benefit of consumers.” And as an Amazon Prime member, I count myself among the appreciative beneficiaries of this charity. There are many reasons why Amazon remains (alongside Google, arguably) the most fascinating of the “new economy” (to use a term from Amazon’s infancy) companies. With Steve Jobs departed from Apple and this Earth, no other company is as identified with the idiosyncratic will, and whims, of its founding CEO. No other company appears as malleable when it comes to defining its core business. No other company wrestles so transparently with the long-running debate over whether content or hardware is king in the digital age. No other company seems to have as hard a time saying no to new ideas or ventures. Amazon is in the businesses of cloud computing; media production and distribution; package delivery; phone and tablet manufacturing; book publishing; and oh, and let’s not forget: retailing! One gets the sense that there is no harebrained scheme (or brilliant idea—it’s a fine line) thrown out in an Amazon employee meeting in Seattle that doesn’t get pursued. No other company seems as confused about what it wants to be when it grows up. Flummox is the perfect word to describe what Amazon does to its competitors, its owners, and even its grateful consumers. Amazon can make us uncomfortable both because it refuses to play by the rules that other companies must follow, and because it seems too eager to be all things to all people. You know that upbeat person who hovers constantly to do anything possible to make your day better? Sometimes I feel like Amazon is the corporate equivalent of that odd, unsettling person. But the monopoly charge is overstated. Yes, Amazon has a commanding market share in book sales, especially e-books, but its own actions (advancing the e-book revolution) have lowered the barriers of entry to the business. Selling books is the one category of business where Amazon has performed brilliantly since Day One, which is why it sells some 40 percent of all new books in this country. But even here, the company could be one misstep away from falling prey to plenty of other competitors, some of them with far deeper pockets: Apple, Google, Barnes & Noble, the aggrieved publishers, and so on. Beyond this scuffle, Amazon is taking on the likes of Netflix and established media conglomerates as it seeks to produce TV content; other technology titans like Sun, Oracle, and IBM in its cloud computing business; and companies like Samsung in its hardware-manufacturing aspirations. Although it has a commanding lead in e-commerce, traditional retailers like Walmart and Target may someday get their act together when it comes to selling stuff online. Amazon certainly isn’t the only Internet company that has burned money to grow. What is unique about the company is that its cash fire has burned for almost two decades. It’s Bezos’ most astonishing feat, being able to play with other people’s money (shareholders and the buyers of Amazon’s extravagant bond offerings) for so long. They remain in a state of suspended animation, waiting for that future moment when Amazon will flick a switch and become a “normal company” that prioritizes making money off of its customers. But is that even what Bezos wants? Does he have the discipline to do so? Wouldn’t that be, well, too boring for him? This isn’t the first time that Wall Street analysts and others are questioning whether Amazon can afford to stick to its whimsical ways. However, in the past Bezos has always managed to buy himself more time, either by registering some solid quarters just to show he can, or by hyping some new revolutionary venture that will change everything. But at last, time may be running out on Bezos. His ambition to create the one indispensable platform for connecting people to information, goods, and entertainment is now bumping up against the two most formidable companies of our age: Apple and Google. The bad news for Bezos is that one obvious step Apple or Google could take to gain an edge over the other is to buy Amazon. And if doubts persist about Amazon, and its stock price continues to fall, such an acquisition will become a very easy deal for either of those companies to pull off—and for Amazon shareholders and employees to cheer on.